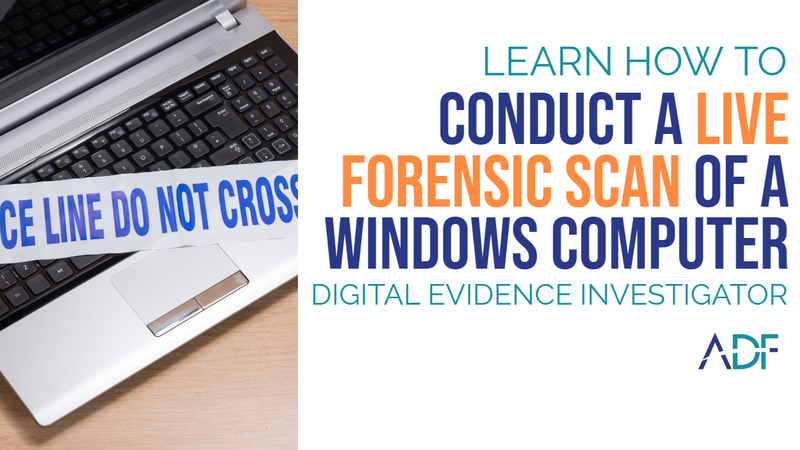 Learn how to conduct a Windows live scan with ADF Solutions Digital Evidence Investigator. Two USB ports are required to complete a scan, one for the Collection Key and one for the Authentication Key, once the scan has started the Authentication Key can be removed. A USB hub may be used in cases where the target computer only has one USB port. When running a live scan from a Collection Key it is possible to create a RAM dump of the computer. RAM dumps can then be analyzed with appropriate software (e.g. Volatility). READY TO ACCELERATE YOUR DIGITAL INVESTIGATIONS? Advanced Digital Forensic Solutions, Inc. Copyright 2019 | ADF ♥ Digital Forensics.